John Willimann, the President and Chief Science Officer of Global Life Technologies and developer of Nozin joins the show. Summer's coming - people will be travelling on planes and also going to amusement parkls, malls - all places that are major breeding grounds for germs. What do you recommend to protect yourself? How and why was the Nozin Nasal Sanitizer developed? Why would you use Nozin Nasal Sanitizer? It's supposed to be one of the worst allergy seasons ever. You developed Nozin Allergy master. Tell us about it. 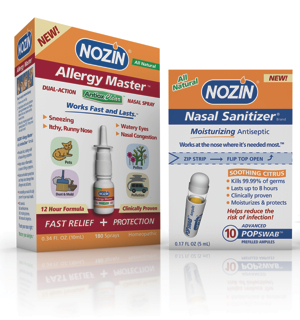 What sets Nozin Allergy Master apart from other allergy products? John A. Willimann is the President and Chief Scientific Officer of Global Life Technologies Corp. In addition to executive responsibilities, Mr. Willimann oversees technology development initiatives, patents/regulatory, clinical trials and sponsored research programs. These included serving as the Principal Investigator on two grants from the National Institutes of Health in collaboration with researchers at the Johns Hopkins Bloomberg School of Public Health, Mr. Willimann is a key developer of several patented NOZIN(r) branded technologies-including NOZIN(r) Allergy Master(r) and Nasal Sanitizer(r) antiseptic. Where can I buy NOZIN? You can purchase NOZIN product online at drugstore.com, CVS.com, walgreens.com, amazon.com and at NOZIN.com by clicking here (USA only). Giant Eagle stores, Kerr Drug stores, Winn Dixie, Walgreens, Save Mart, Tops Markets & onboard United Airline flights carry NOZIN. NOZIN product is coming to more pharmacies and supermarkets, so check with your local stores. Your Pharmacist or local store can also order NOZIN product for you from Cardinal Health (use order #4266292) and from AmerisourceBergen (use order #108593).